The use of white phosphorus by the US-led coalition in Mosul is “not within the international legal framework,” the UN coordinator for rights group Salam for Democracy and Human Rights told RT, adding that Baghdad should launch an independent investigation. "There's no area [in Mosul] with a large space... the houses are built against each other so it's really intense. So using such a weapon in this area is not within the international legal framework," Mohammed Serkal told RT. "It is banned… in areas like this... especially now with the heat in Iraq... with this it could burn easy and that could have consequences, not just now but on the future as well," he said. White phosphorus burns when it comes into contact with oxygen, producing high-temperature heat and characteristic white smoke. Serkal also said there "seems to be a blackout on Mosul" in the media, because "we don't have many NGOs in Mosul who can verify information, who can report on information on the airstrikes" on the city, and because the city is inaccessible. Serkal is calling on the Iraqi government to investigate any criminal behavior "independently and transparently," without the US being involved. The US-led coalition has admitted to using munitions loaded with white phosphorus, with a New Zealand general disclosing it earlier this week. The explanation was that the substance has been used for creating smokescreens to aid fleeing civilians. It comes after an increasing number of claims pointed to the use of such munitions in Mosul and Raqqa, Syria in previous weeks. The cities are the two strongholds of Islamic State (IS, formerly ISIS/ISIL). Human Rights Watch (HRW) has also criticized the coalition for deploying the munitions by releasing a statement entitled “Iraq/Syria: Danger from US white phosphorus” on Wednesday. The Americans saying that they’re only using artillery-delivered white phosphorus as a smoke screen, but the group warned against employing it “to attack personnel on the ground or material objects,” Mary Wareham, the advocacy director of HRW’s arms division, told RT. “We see enough risk in the use [of white phosphorus] and see horror stories from past use in previous conflicts. We want the US to be extremely careful and sparing when it uses white phosphorus – if it uses it at all,” she said. 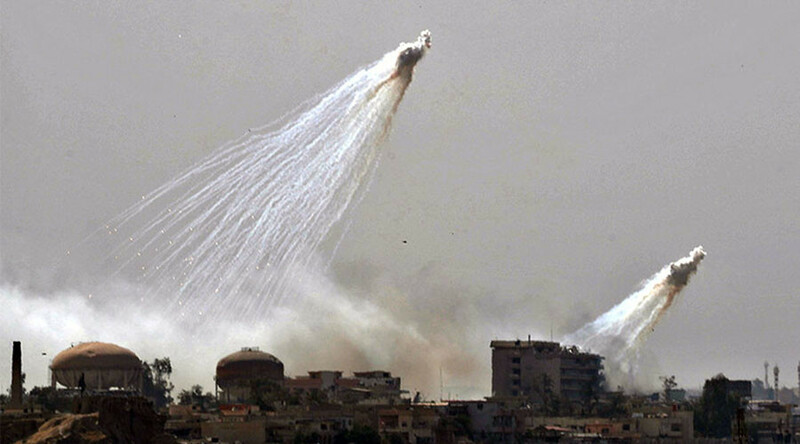 “Our problem is that there are no clear rules in terms of using white phosphorus as a weapon. It’s not covered by international law. It’s not primarily designed as an incendiary weapon. But its incidental effects can cause terrible injuries – burns, smoke inhalation,” she said. 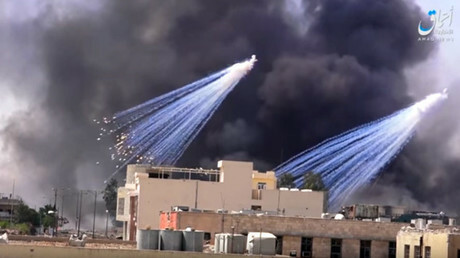 Even after being deployed in the air, white phosphorus keeps burning when reaching the ground and HRW wants to know “what’s it hitting on the ground?” and if “adequate provisions [are] being taken to ensure that civilians aren’t falling victims to white phosphorus,” Warren said. She also stressed that Human Rights Watch has not yet identified any victims of white phosphorous in Mosul and Raqqa, adding that, according to its information, the US-led coalition has not used the controversial munition in the last couple of days.